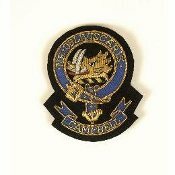 Our Scottish Clan Crest Blazer Badges are outstanding. No sewing. Comes with tie tacks for 3 pins. Goes on jackets, shirts, bags or just about anything. Gold Wire stitching 3 x 4 inches. Call for any additional clans. Most are available!